There are 26 Assisted Living Facilities in the Providence area, with 7 in Providence and 19 nearby. The average cost of assisted living in Providence is $3,712 per month. This is higher than the national median of $3,346. Cheaper nearby regions include Johnston with an average starting cost of $3,230. To help you with your search, browse the 95 reviews below for assisted living facilities in Providence. On average, consumers rate assisted living in Providence 4.3 out of 5 stars. Better rated regions include East Providence with an average rating of 4.3 out of 5 stars. Caring.com has helped 6 families in Providence find high-quality senior care. To speak with one of our Family Advisors about assisted living options and costs in Providence, call (855) 863-8283. Providence, the Rhode Island state capital, is one of the oldest cities in the country, and home to eight hospitals and seven colleges or universities. The state is bordered on the east by the Atlantic Ocean and is known for its beaches and easy access to fishing and boating. Downtown Providence offers quality dining, shopping and historic walking tours for seniors to enjoy. Nine percent of the residents of Providence are over 65 years of age. There are 14 assisted living facilities in Providence, with 20 such communities nearby, all offering a broad variety of programs in addition to memory care and short-term rehabilitation services. Rhode Island's Department of Health licenses and monitors all facilities. Rhode Island was a leader in monitoring air quality and has had a formal program in place since 1968. Seven stations throughout the state constantly monitor air quality. Providence's cost of living is above the U.S. average, but the cost of the median home is below both the Rhode Island and U.S. averages. Providence abounds in cultural life. Waterfire is a non-profit arts organization providing creative urban experiences. The Rhode Island School of Design Museum has visual exhibitions and musical events. There are museums dedicated to the Culinary Arts, Natural History and much more. The Roger Williams Zoo invites visitors to experience nature at its best. Providence has a higher crime rate than surrounding towns and cities, however the city employs more police officers than the U.S. average. There is an abundance of public transportation in and around Providence including Amtrak rail service and the T.F. Green Airport in nearby Warwick. The Rhode Island Public Transit Authority (RIPTA) provides reliable and inexpensive transportation around the city and in surrounding areas. The climate in Providence is humid continental. Summers in Providence are generally warm and humid with an average July high temperature of 82 degrees. Winters are cold with about 36 inches of snowfall per year. The average low temperature in January is 20 degrees. Assisted Living costs in Providence start around $3,712 per month on average, while the nationwide average cost of assisted living is $4,000 per month, according to the latest figures from Genworth’s Cost of Care Survey. It’s important to note that assisted living rates in Providence and the surrounding suburbs can vary widely based on factors such as location, the level of care needed, apartment size and the types of amenities offered at each community. 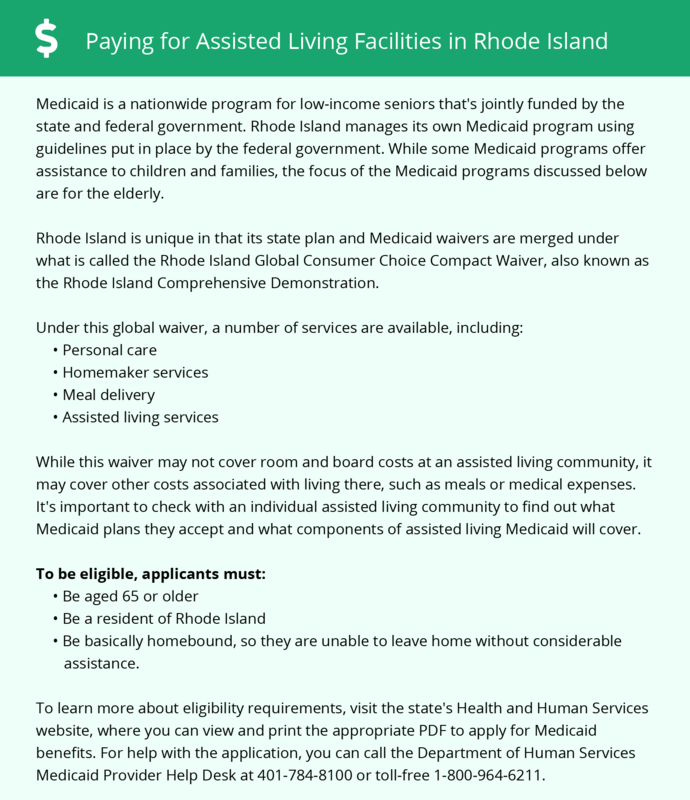 Rhode Island provides funding for an SSI Enhanced Assisted Living Program to adults aged 65 or older who meet the specific guidelines. Such individuals must not require the extensive medical services of a nursing home. To see a list of free assisted living resources in Providence, please visit our Assisted Living in Rhode Island page. Providence-area assisted living communities must adhere to the comprehensive set of state laws and regulations that all assisted living communities in Rhode Island are required to follow. Visit our Assisted Living in Rhode Island page for more information about these laws.